The art of healing comes from nature and not from the physician. Therefore, the physician must start from nature with an open mind. This article builds upon ideas established in Iodine As Medicine and Why KI. It is not required to read them first but it will help to put the information we are presenting here in context. In the Why KI article we made clear arguments showing why potassium iodide (KI) is the best form of iodine for ingestion. In Part IV of the article we discussed why Lugol’s iodine, a combination KI and molecular iodine (I2), is also effective. There are many in the iodine-taking community that prefer to have I2 included in their iodine supplement. Some claim that it helps maintain a healthy level of stomach bacteria. Some suggest that it is more effective in displacing excess, and therefore, toxic halides stored in the body. These claims are difficult to prove. There is no knowledge of the mechanisms at play or how they work. They are testimonials and it is left as a matter of consumer preference. Since molecular iodine can be absorbed right into the cell, as with trans-dermal applications, including it may also be helpful for individuals with damaged Sodium-Iodide Symporters when beginning to supplement with iodine for the first time. Those who wish to have I2 included in their supplements should consider how much of it should be taken. They may ask, what relative amounts of I2 and I- should be consumed in order to emulate the iodine intake from edible seaweeds consumed in Japan? This article addresses that question. Sea vegetables contain both I- and I2. The relative amounts of I- and I2 depend on the type of sea vegetable. We will examine the relative amounts of both forms of iodine in different sea vegetables. We want to determine an appropriate ratio of I2 to I- that reflects what is naturally occurring in the sea vegetables most eaten in Japan. This ratio can be used as a basis for formulating an iodine supplement that includes I2. Edible seaweed can be grouped into three different phylum: brown, green and red algae. Brown seaweeds are a very important source of food for many aquatic animals. Humans also eat them and sometimes use it for medicine. It has traditionally been used for treating thyroid goitre. The link between iodine and thyroid hormones was established soon afterwards. Green seaweeds tend to be single cellular. They grow mostly in freshwater and sub-aerial locations. Red seaweeds are mostly multi-cellular marine algae that reproduce sexually. Brown algae includes edible seaweeds such as Wakame, Kombu, Bladderwrack and Hijiki. Green algae includes edible seaweeds such as Chlorella and Sea Grapes or Green Caviar (Caulerpa Lentillifera). Red algae includes popular edible seaweeds such as Nori and Irish Moss. There are over 30 kinds of edible seaweeds. Our discussion will include the five most popular seaweeds in the Japanese diet. The genus most demanded by the Japanese diet is Nori. Though it looks green it belongs to the red algae phylum. Nori has been eaten in Japan since ancient times. It was originally consumed in a wet form as a paste. During the Edo period in the 1750’s the Japanese started processing nori paste using papermaking methods to produce the dry sheets we are familiar with today. Nowadays it is mostly consumed in its dried paper form. The second most demanded genus is Wakame. Though it has a bright green color it belongs to the brown algae phylum and is classified as a kelp. It is harvested by hanging collector strings in the water where Wakame spores attach and grow upon. Wakame is often dried for preservation and re-hydrated for cooking. It is appreciated for being tender and succulent. In the west it is best known for being a tasty addition to miso soup. Wakame is also served on its own or with root vegetables or fish and also in salads. Wakame also comes in second when it comes to iodine content. It has much less iodine than Kombu and tends to have two to four times the iodine content of Nori. The third most demanded genus is Kombu. It also belongs to the brown algae phylum and is classified as a kelp. It grows in long strips and is extensively cultivated on ropes in the seas of Japan and Korea. 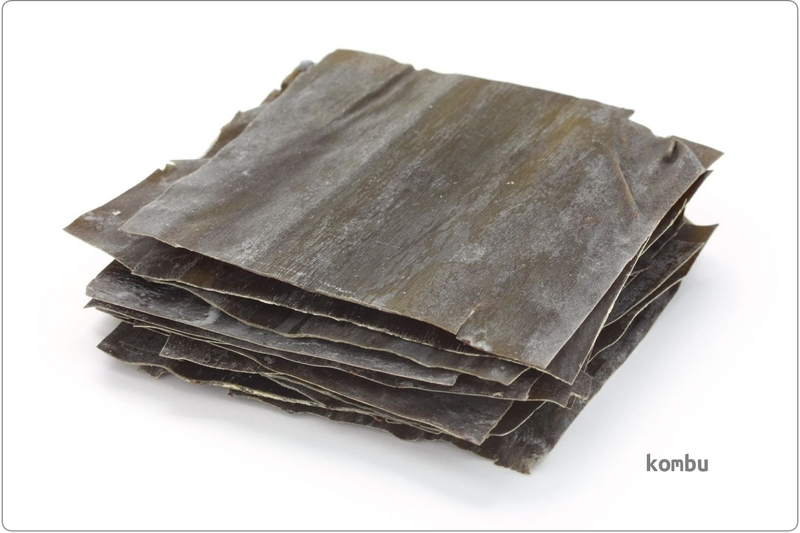 Kombu has a chewy or gelatinous texture and is very delicious. It is widely eaten in East Asia and is one of the main ingredients in Japan for making soup stock (dashi). It is used to flavor other dishes as well, especially sushi rice. Kombu is also chopped into fine strips and made into a flavourful chilled side dish (tsukudani). 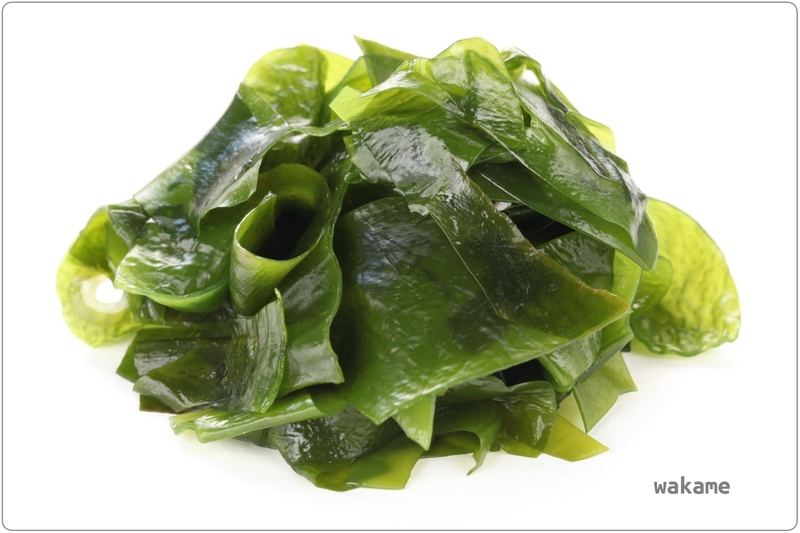 Kombu has very high iodine content even among seaweeds. Nori, Wakame and Kombu make up virtually all of the seaweed consumed in Japan. Other brown seaweeds, such as Bladderwrack and Hijiki, are also commonly used but to a much lesser extent. We want to have an estimate of the I2 to I- ratio that the Japanese consume by eating seaweed. We will consider what kinds of seaweeds the Japanese are eating and how much of each kind is eaten. We will also consider the I2 to I- ratio attributed to the different phyla. 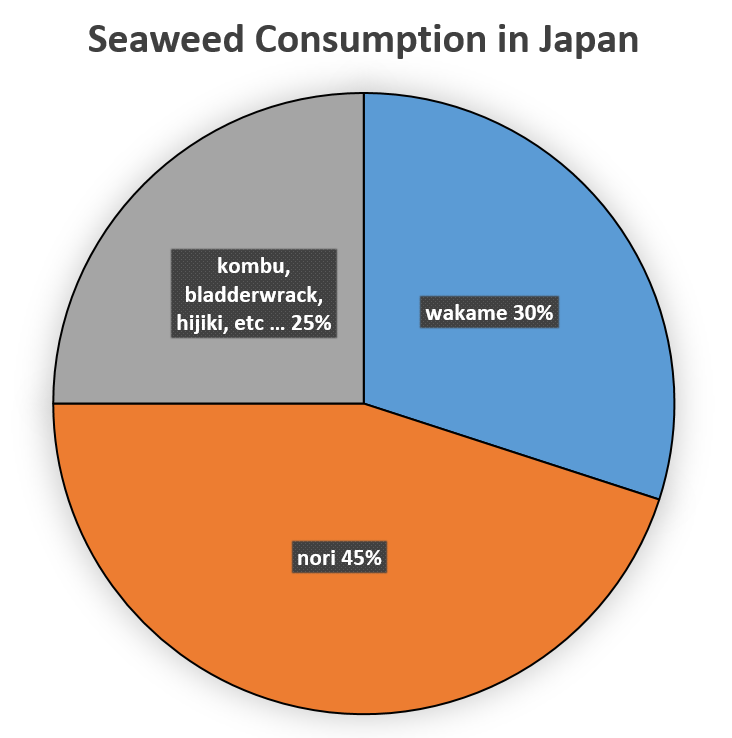 After putting this information together we will provide an estimate of the average I2 to I- ratio for consumed seaweeds in Japan. 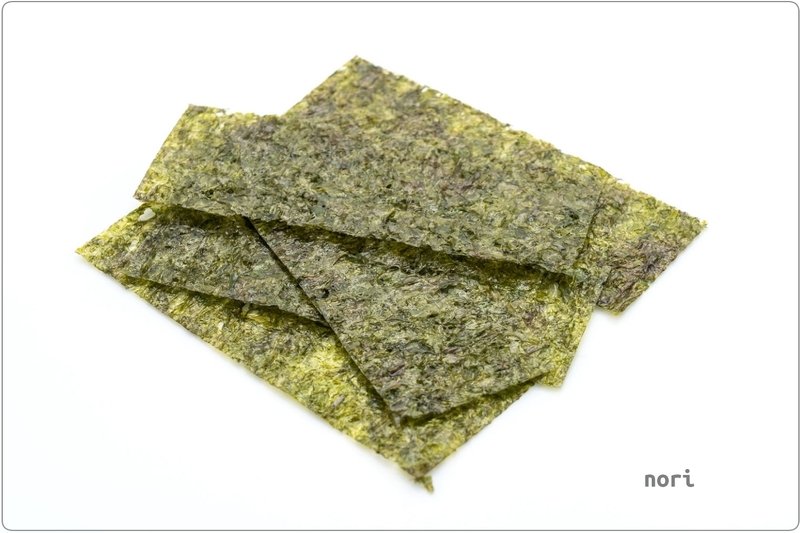 Nori is the most consumed edible seaweed in Japan. It accounts for 45% of seaweed consumption.12 The second most consumed seaweed is Wakame which accounts for 30% of seaweed consumption.13 These two seaweeds alone make up 75% of the seaweed consumed. Most of the remaining 25% is attributed to brown seaweeds like Kombu, Bladderwrack and Hijiki. Attributing the remaining 25% to brown algae is a reasonable estimate and represents an acceptable margin of error. We will reference two sources for the iodine content of seaweeds. The first is a study done using samples from multiple Asian countries.14 In this study samples were taken from Japan, China, Taiwan, Korea and Thailand. 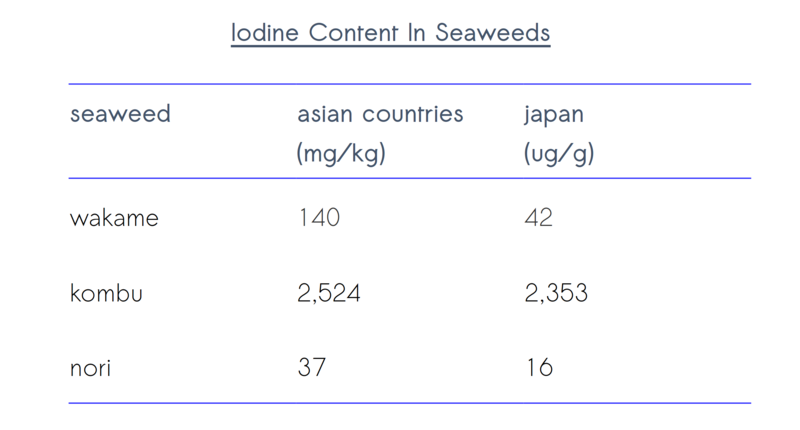 The second source is a study done using samples only from Japan.15 The table below compares the results of both studies and show that the relative amounts of iodine in seaweeds are consistent. In both studies it is clear that Kombu has a much higher concentration of iodine than Wakame and Nori, and Nori as the lowest concentration of iodine. These factors come into play when we use this information to assign weights to the I2 to I- ratios of different seaweeds. Since we are interested in the iodine intake from the Japanese diet we will use the data from the second source in our analysis. Researchers from the department of Analytical Chemistry, Nutrition and Bromatology at the University of Santiago de Compostela in Spain developed a method to determine total I2 and I- inedible seaweeds. In 2007, they published results from harvested seaweed on the Galician coast in Northwest Spain. Their analysis showed that “most of the iodine is present as iodide in brown seaweed samples (90% of the total iodine), while red seaweeds have iodide percentages lower than 30% and green seaweeds lower than 80%.”16 This translates into I2 to I- ratios of 11%, 233%, and 25% for brown, red and green seaweeds respectively. 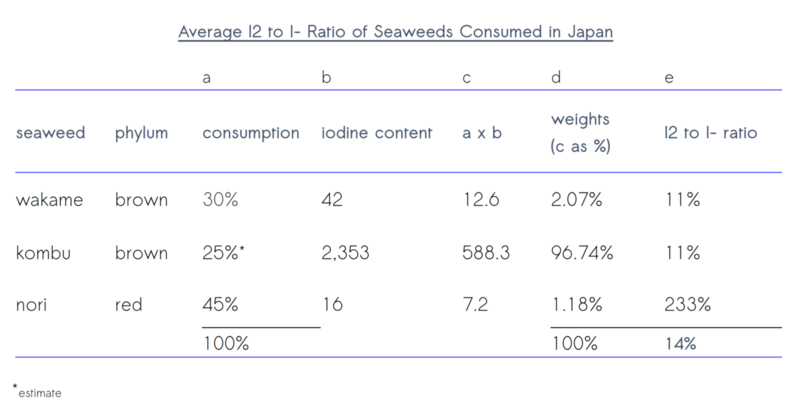 Now lets combine the information about the most consumed seaweeds, the iodine content of these seaweeds and ratio of iodine forms to estimate the I2 to I- ratio of iodine taken up by seaweed consumption in Japan. Working from left to right the relative consumption amounts (A) are used as weights for the iodine concentration amounts (B). Multiplying these figures gives a relative amount of iodine concentration consumed (C). In order to use these amounts as weights for the ratios we represent them as percentages that sum to 100% (D). 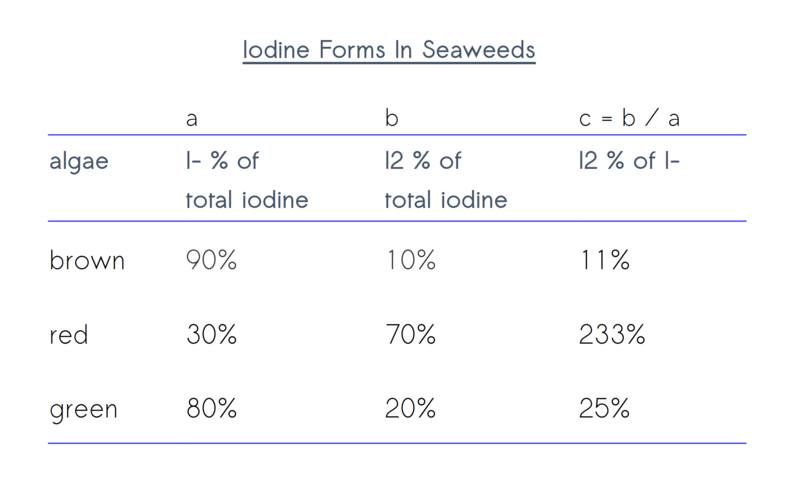 These are estimates for the relative amounts of iodine ingested from the different seaweeds. We can see that Kombu is heavily weighted at 97%. The brown seaweeds account for 99% of the iodine intake. When we multiply these percentages by the ratios (weighting the ratios) we arrive at a weighted average I2 to I- ratio from seaweed consumed in Japan that is 14%. In short, the Japanese consume mostly brown seaweeds with the exception of nori which is a red seaweed. About 99% of the iodine ingested comes from brown seaweeds which have an I2 to I- ratio of 11%. The high I2 to I- ratio of 233% in red seaweeds brings the average up to 14%. Now lets compare our estimated ratio of I2 to I- from seaweed in the Japanese diet to Lugol’s iodine tablets and the Zen Haus Dual Form Iodine Supplement. 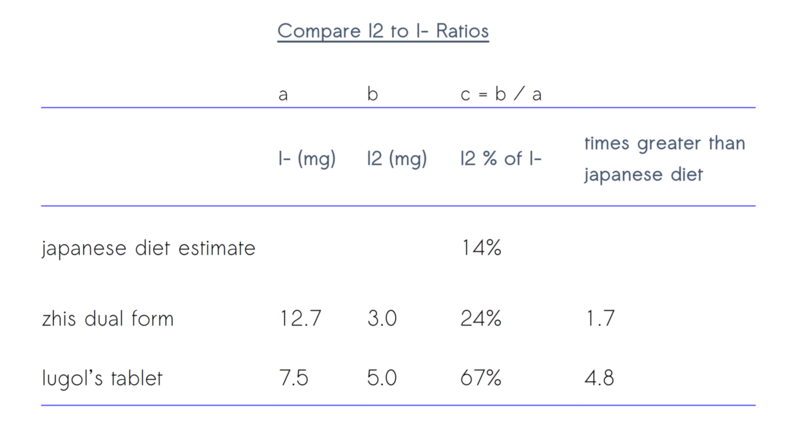 Here we can see that both the Zen Haus Dual Form product and Lugol’s iodine tablets have a relatively higher amount of molecular iodine compared to the Japanese diet. The dual form iodine supplement ratio is 1.7x higher and the Lugol’s iodine tablets ratio is 4.8x higher. Perhaps the Lugol’s iodine tablets ratio is too high and this is why some people have digestive issues when taking them. As we pointed out in Why KI – Part II, studies have indicated that the presence of molecular iodine increases the risk of iodism and negative side effects. By extension we may presume that greater amounts of molecular iodine will increase these risks and negative side effects. Though the Zen Haus Dual Form product is also higher than what we estimate in the Japanese diet, it is much lower than Lugol’s iodine tablets and is a safer alternative. We designed our dual form iodine product to address the needs of those who want to use iodine supplements to help control stomach bacteria and perhaps help displace toxic halides in the detox phase. Our exposure to high amounts of halides is more of a modern issue and this justifies some departure from what the traditional Japanese diet informs us about iodine intake. Afterall, controlling stomach bacteria and displacing toxic halides go beyond the basic need of supplementing with iodine. Since molecular iodine can be absorbed right into the cell, as with transdermal applications, including it may also be helpful for individuals with damaged Sodium-Iodide Symporters when beginning to supplement with iodine for the first time. We can only speculate on the additional benefits of molecular iodine in iodine supplements. There is not enough research to support claims of molecular iodine controlling stomach bacteria and more effectively displacing toxic halides. However it is clear that some individuals prefer taking molecular iodine. The dual form iodine supplement, which includes molecular iodine, is a safe alternative to Lugol’s iodine tablets. Moreover, the dual form formulation more closely represents the Japanese iodine intake from seaweeds. If you want take molecular iodine safely we suggest you move with the large crowd of Japanese seaweed eaters over the centuries and use a product that has a balance of iodine and iodide comparable to the seaweeds consumed. 2) Abraham, G.E., Flechas, J.D., Hakala, J.C. (2002). Orthoiodosupplementation: Iodine Sufficiency Of The Whole Human Body. The Original Internist, 9, 30-41. 4) World Health Organization: World health statistics 2010: Geneva, Switzerland. Retrieved from http://www.who.int/gho/database/WHS2010_Part2.xls. 9) National Center for Health Statistics: Health, United States, 2007. With chartbook on trends in the health of Americans. Hyattsville, MD; 2007.